In cooperation with Timothy Khalifa. First Place Design Winning team. Time period: 3 Days, starting on March 6th, 2017. Anonymous Review. Winners sponsored by EPIC Metals. Prompt: The teachers at the Pittsburgh Environmental Charter School would like to create a prototype self-sufficient shelter to engage their students in learning about the universe through celestial observations. 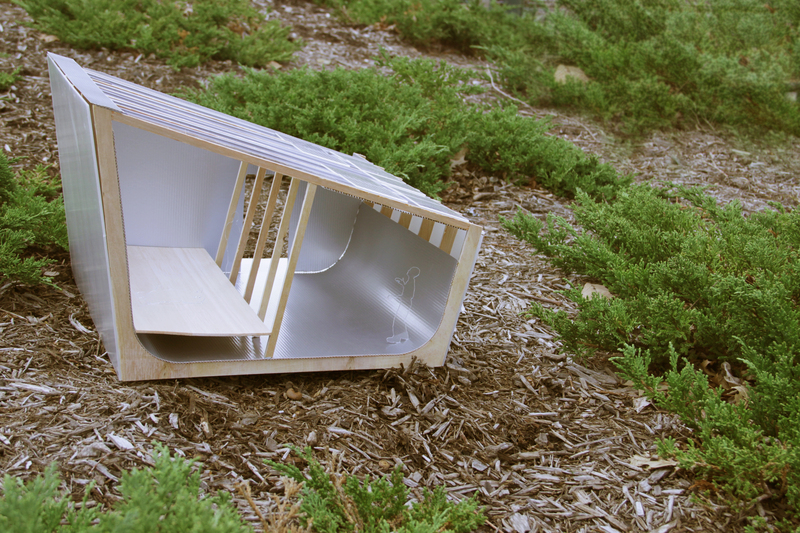 The prototype shelter will first be installed on their Milton Street site. After using and evaluating the prototype, the design will be refined through iteration and the actual shelters will be constructed and deployed in the Laurel Highlands. The shelter must produce all the energy that its occupants need from bio or renewable energy systems. It must protect the occupants from wind, rain and snow and allow night time observations of the sky. Designed like a chashitsu (Japanese tearoom), the celestial observation shelter is a simple one-story space planned intentionally to be almost uncomfortably small, with little to no fenestration on each of the four walls. This provides an environment for intimacy and conversation, while directing attention towards the sky above. This geometry is inspired by the hull of ships which represents adventure and discovery and the sextant, an instrument of maritime navigation and astronomical study, emphasizing the practical use of celestial observation as a means of way-finding and understanding our relative presence in the universe. Complimenting this sense of curiosity with a greater understanding of its origins, a camera obscura allows for the entrance of the universe through a projection onto the floor, an opportunity to use the space as a dynamic learning environment. Bringing the wonders of the universe into the confines of a “classroom”, where students can feel their presence amongst the stars. Enhancing a sense of continuity, and constant awareness of being in a vessel. A single plane swoops from the entrance of the universe to its exit. 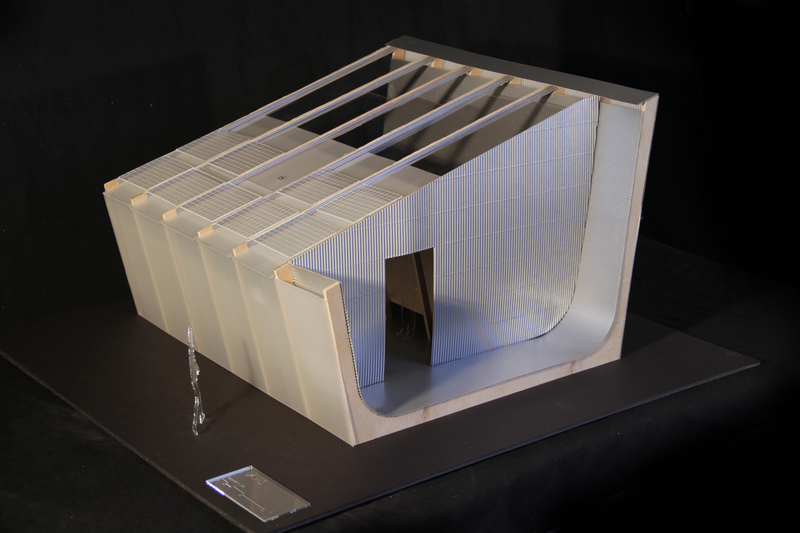 The plane forms the space, acting as a floor system, an enclosure system and a structural system. Loosing oneself as the universe opens up above. A series of operable windows slide open to allow for the eventual exit of the universe and accentuate the vertical relationship. 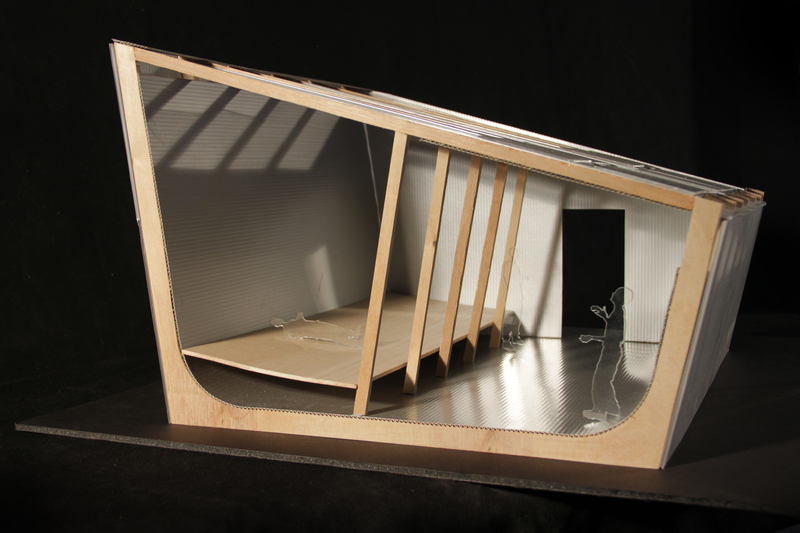 The shelter is designed as an aggregation of attach additional bays to the end in the event of an expansion. The adjustable footings produced in the sectional perspective below also allows situation in uneven terrains.